Why Is Flossing Important - and How Can You Make It Easier? Ask a Dentist! Why Is Flossing Important – and How Can You Make It Easier? Ask a Dentist! If you asked any dentist which habit their patients struggle with the most, nearly all of them would say flossing! There’s a multitude of reasons that people have a hard time with flossing. For starters, some people don’t learn just how important it is until they’re well into adulthood and already “set in their ways.” For others, they’re too tired at the end of the day to do yet another task before bedtime. But, since flossing is crucial for a healthy smile, it’s worth it to learn some tricks for making it easier. Keep reading to learn about the many ways flossing benefits you and get some tips for making it easier. Your smile will thank you! Plaque is mainly made of different kinds of bacteria, some of which are directly responsible for cavities and gum disease. It’s a lot easier and less expensive to prevent these problems than have them treated, so effective plaque removal is essential. Gum disease – Gum disease is actually the leading cause of tooth loss and also increases your risk for many serious health conditions, so it’s very important to keep your gums healthy. The gum tissue that surrounds each tooth is actually a “pocket” that collects plaque and bacteria. In healthy gums, these pockets are just 1-3mm, but brushing alone won’t keep them clean. Over time, this can lead to gum disease and eventual tooth loss. Cavities – Your teeth have a “contact point” where they touch. Floss is the only thing that can reach this area and remove plaque. Cavities are quite common in between the teeth, and, in fact, they’re sometimes called “flossing cavities,” although a better name would be “not-flossing cavities”! Bad Breath – Odor is caused by bacteria. If you leave behind 1/3 of the total plaque and bacteria in your mouth, it’s no surprise that it leads to bad breath. How Can You Make Flossing Easier? When you’re starting a healthy habit, it’s helpful to begin with small, attainable goals. For example, if you don’t floss at all, aim to floss just 3-4 days a week at first. Once you’ve got that down, it will be easier to do it every day. If you find that you’re too tired at night to floss, try doing it earlier in the day when you have more energy, like right after dinner or even lunch. Or, you might find it easier to floss your bottom teeth in the morning and your top teeth at night. There are also several tools that can be helpful such as floss picks, so experiment to find what works best. It’s really just a matter of finding the right tricks to make it easy and convenient. And, once you do, you’ll be well on your way to less dental work, fresher breath, and an overall healthier smile! Dr. Chris Long has 15 years of experience as a family dentist. In that time, he’s seen firsthand that people who brush and floss consistently have fewer dental problems than those who don’t, and always gives his patients oral hygiene tips to help them be as successful as possible. If you have any questions about flossing, he can be reached via his website. 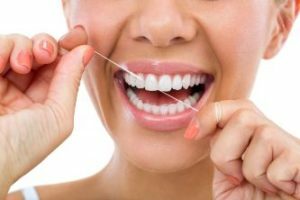 Comments Off on Why Is Flossing Important – and How Can You Make It Easier? Ask a Dentist!